Library image #4393: Backpacking in Little Dominguez Canyon, taken May 2017. The United States Congress designated the Dominguez Canyon Wilderness (map) in 2009 and it now has a total of 66,280 acres. All of this wilderness is located in Colorado and is managed by the Bureau of Land Management. The Dominguez Canyon Wilderness displays an array of ecosystems, ranging from upper Sonoran piñon-juniper desert along the Gunnison River, to Douglas-fir and ponderosa pine to aspen at higher elevations. Dominguez Canyon Wilderness consists of two major canyon systems, Big Dominguez and Little Dominguez. The canyons drain the northeastern corner of the Uncompahgre Plateau. Little Dominguez is the longer of the two at approximately 12 miles in length. It joins the larger Big Dominguez Canyon a little over a mile before their confluence with the Gunnison River. The area possesses outstanding geological features, spectacular scenery, ecological diversity, two cascading mountain streams and opportunities for solitude and primitive unconfined recreation. 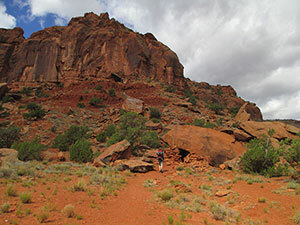 The terrain is characterized by large mesas dissected by deep red slick-rock canyons and arroyos. The area provides valuable wildlife habitat for desert bighorn sheep, deer, elk, mountain lion, black bear, wild turkey and chukar. Fishing is year round in Big Dominguez Creek. Plenty of other recreational opportunities are available for your enjoyment such as, camping, hiking, horseback riding and don't forget your camera! Planning to Visit the Dominguez Canyon Wilderness? How to follow the seven standard Leave No Trace principles differs in different parts of the country (desert vs. Rocky Mountains). Click on any of the principles listed below to learn more about how they apply in the Dominguez Canyon Wilderness.